Here is a section of the board that represents what I like to call "lasts." It talks about the last time a particular event has happened. This historical perspective is useful when a unique event happens in a game, like, in hockey, a penalty shot , for example. 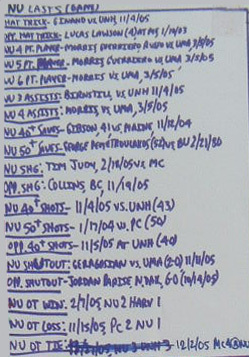 Here you can see I list the last time an NU player scored a hat trick (Ginand, vs. UNH, 11/4/05); the last time an opponent scored a hat trick; the last time an NU player scored four, five, and six points in a game; the last time a goalie made 40 and 50 saves in a game; the last NU shorthanded goal, the last time an opponent scored a shorthanded goal; the last time NU had 40 and 50 or more shots in a game, the last time an opponent had 40 or 50 shots in a game, the last shutout for and against, and the last overtime win, loss , and tie. This information is provided courtesy of game notes, which are listed on the team website.